My mother was a ballet dancer. She was also a lousy cook. While other moms were baking cookies for classroom parties, her life was a frenzied sequence of classes, practicing, rehearsals, and performances. This simple truth, as much as any subsequent culinary training, shaped my career as a food writer. Even if my mother had enjoyed cooking, her devotion to ballet would have nixed it. Like most dancers, she had conflicted attitudes about food. Despite her petite size (5 feet tall; 90 pounds), she was always on some sort of diet. (She once lived on roasted veal breast for a month straight.) She “scooped” bagels (scraped out the doughy interior) long before the advent of the Atkins diet. Our meals were adult and impromptu—thrown together at the last minute and served at the then unfashionably late hour of 8 or 9 p.m. (How I envied my friends, who sat down for dinner with their families at 5:30 p.m.) I was often served a new phenomenon that was supposed to revolutionize American eating habits in the 1950s—the TV dinner. So I taught myself to cook an early age—it was a matter of self-defense. Of the little cooking my mother did, I chiefly remember its robustness. Extreme cuisine before it was fashionable. Steaks charred black as coal on the outside, served rare—almost raw within. Prime rib with plate-burying bones seared crusty and dark for gnawing. (Curiously or perhaps prophetically, my mother was the family grill master.) She never made a sauce I can remember, and her idea of the ideal condiment was an astringent relish of raw cranberries and kumquats. Appropriately for a non-cook, my mother loved raw foods. Back in the 50s, you could eat uncooked hamburger without running risk of Salmonella poisoning and we would devour it greedily—decades before I heard of steak tartar. When fresh peas were in season, we’d shuck and eat them raw, too. Even my mother’s take on milk—that staple for kids in growth spurts—had a curiously adult twist: she’d add a splash of black coffee. No, I didn’t get my passion for food from my mother. I learned something far more important—a passion for and unwavering dedication to one’s craft. My mother died young (at the age of 38)—long before I became a food writer—and very long before I got the idea for Man Made Meals: The Essential Cookbook for Guys. I suspect she would have been pleased that she had an influence on this book. I also suspect she would have read it with no small amazement (the apple fell very far from the tree in our family) and a twinge of alarm. I mean, if she were to sample the fruits of my food writing, would she still look good in a leotard?! 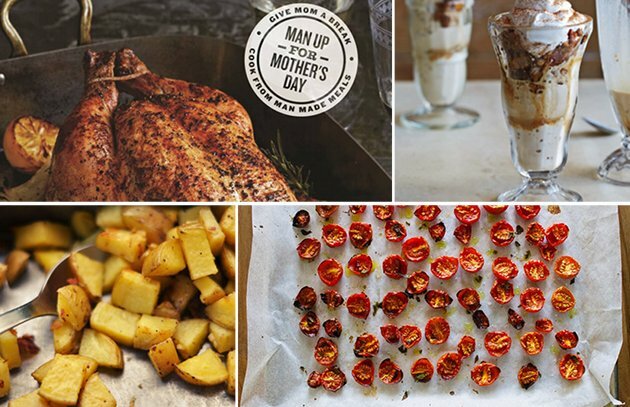 What will you be cooking for Mother’s Day? Tell the community on the Barbecue Board.